Live in the Salt Lake City area? Come visit me at the farmer’s market! I carry a large selection of matted prints in three sizes, as well as 5×7 and panorama-style note cards, photo tile coasters, and some framed, ready-to-hang artwork as well. For more info, check out At The Market or find me on Facebook. Didn’t see the image you want among my market collection? You can order online and then pick up your print from me at the market or my home in Taylorsville and I’ll happily mat it (8×12 or 12×18 prints only) using my standard double white mat free of charge. Available print sizes vary from image to image, largely depending on which camera I was using at the time the image was captured. (For inquiring minds, since making the switch to digital in 2004, I’ve shot with the Canon 10D, 5D, and currently the 5D Mark II.) The shopping cart icon can be found in the lower left hand corner of the screen once you’ve clicked on a thumbnail image. Because my prints are shipped directly from the lab, prints are unsigned by default. If receiving a signed print is important to you and you do not live in the Salt Lake area, please contact me directly and we can coordinate how to make this happen. All digital images are printed through an out-of-state professional lab on matte Kodak Professional Supra Endura VC Digital Paper (aka Traditional E-Surface Paper). Prints are packed flat (mounted on cardboard, bagged, and then boxed – not rolled up in a tube) and shipped via the U.S. Postal Service directly from the lab to your door. Avoid hanging prints in direct sunlight to prevent them from fading over the years. Dye is infused directly into specially coated aluminum sheets with stunning results, no framing necessary. Metal prints come with mounting hardware already attached, allowing the image to float half-an-inch off the wall. The ultra-hard, scratch-resistant surface is waterproof/weatherproof and can be cleaned easily with glass cleaner – just avoid direct sunlight. High gloss is the most popular finish for unsurpassed detail and vibrance. Satin has a softer appearance with minimal glare. Like the modern look of metal prints but not the cost? Having a print mounted onto rigid, yet lightweight, Gator Board can be a good compromise. Please contact me for details. 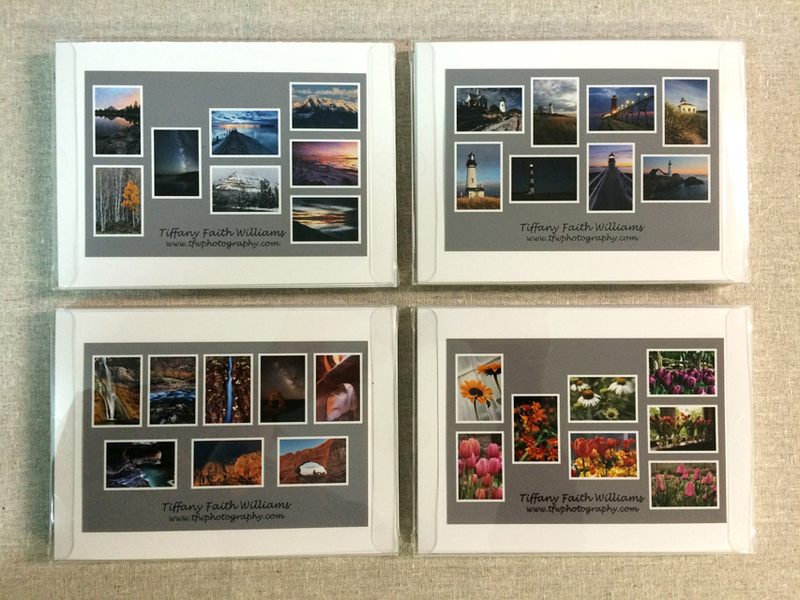 Boxed sets of 5×7 note cards are available through my Etsy shop, TFWPhotography. FREE SHIPPING within the United States for all prints. For international shipping, please use the “Pay by check” option when checking out and I will send you a Paypal invoice once I have determined shipping costs. A Paypal account is not required to use your credit card. If you have questions, special requests, or need custom sizing, please don’t hesitate to email me at loading... .